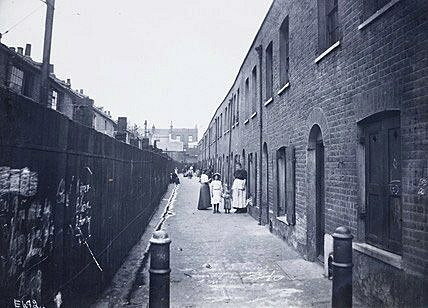 Slum street in Bethnal Green, circa 1900. Photo: Wikipedia. London is too big of a beast to take in at once. Her citizens, be they short term or lifelong, must chop up the sprawling city into manageable bites if they ever hope to comfortably digest it. When I lived in the Big Smoke, I rented a flat south of the Thames. Like all Londoners, my neighborhood became a metropolis in microcosm. A greater place existed outside my home of Stockwell, a former council housing block in south London, but it was a foreign land, as accessible as a far off of nature. When the lease on my room ended, I set out in search of a new place to live. Within a few months, I had hopscotched across London, experiencing its streets from the posh to the residential to the desperate, living alongside Jamaicans and Portuguese, Greeks, Japanese, and Colombians. It was a veritable United Nations of neighborhoods that no other city has come close to approximating. Through it all, the neighborhood that felt the most quintessentially London was Bethnal Green in the cityâ€™s East End. At the time, Bethnal Green was a collection of fading working class Cockney families intermixed with Bangladeshi immigrants. Today, those migrants face a new wave of transplants: young, middle and upper class Britons seeking urban authenticity, otherwise known, even if the term is exhausted, as hipsters. In my mind, the oft-mythologized East End is the gritty essence of London: A rain-slicked mass of concrete and brick where one could find the last true eel and pie shops of the capital, packed with enclaves of Irish, Jews, Caribbeans, Indians, Nigerians, Bangladeshis, and Pakistanis. Criminals stalked these streetsâ€”including Jack the Ripper, the East End Jewish gangsters depicted in Peaky Blinders, and the notorious Kray Twins. Ronnie Kray murdered George Cornell in cold blood in front of numerous witnesses at The Blind Beggar, a Bethnal Green pub that dates as far back as 1654. It was here that a coalition of anarchists, labor unionists, socialists, communists, immigrants, and Jews also aced down thousands of blackshirt fascists at the Battle of Cable Street in 1936. Despite heavy police beatings, the anti-fascists drove Sir Oswald Mosley’s Blackshirts away, tails tucked between their Nazi-sympathizing legs. Seven years later, the real Nazis had returned to London via the aerial bombs of the London Blitz. Bethnal Green had recently opened its own tube station, a new expansion of the London Underground along the Central Line. As WWII grew in its intensity, thousands of Londoners found shelter from Luftwaffe attacks within the bright and spacious subterranean station. By the spring of 1943, the air raids had decreased in frequency, though bombings were still a fact of life. When the air raid siren went off that fateful night of March 3rd, three buses had just emptied themselves of passengers in the vicinity of the station. The commuters rushed for the shelter of the Tube, where 19 stone steps, slicked by rain, led down. A little over a half-mile away, in Victoria Park, the Royal Artillery’s 26th Searchlight Regiment, an anti-aircraft unit, prepared to shoot a new rocket. When the weapon fired at 8:27 PM, its â€˜whooshâ€™ through the airâ€”an alarming and alien soundâ€”roared over the heads of the civilians clambering into the Bethnal Green station. A woman carrying a baby and a bundle of bedding slipped and fell, even as the sound of the rocket panicked those who were trying to enter the Underground. The flow of humanity stopped, surged, swelled and then stampeded, all within the cramped confines of the Tube entrance. Bodies were piled ten-deep, the oxygen quite literally squeezed out of the space. A total of 173 people, mainly women and children, died in the nightmarish Bethnal Green Tube tragedy. For years, the government censored and squashed news of the disaster, which would become Britain’s worst mass civilian death incident of the war. Even given the long, often violent history of the East End, the accident stands out for its carnage. Since the tragedy, Underground employees and passengers alike have reported hearing the cries of women and children within the halls and stairwells of the Tube station. The site is often featured on haunted London tours. Yet Bethnal Green is not as famous of a paranormal destination as, say, the Tower of Londonâ€”perhaps because survivors of the disaster and relatives of the dead still live in the area, and itâ€™s considered in bad taste to capitalize on their tragedy. When I lived in Bethnal Green as a student, I spent many nights walking home amidst its foggy alleyways, usually after a stop at a kebab shop that sold the cheapest pack of Marlboros in London (three quid a pack!). 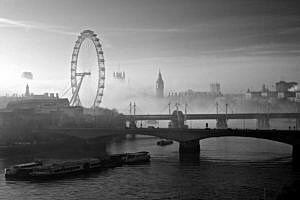 Those nights were always faintly menacing, as London is want to beâ€”rainy, and inhabited by characters who could have easily given the East End gangsters of old a modern-day lesson in violence. But beyond that physical danger, there was sometimes an existential fear, a dread that coalesced in the emptiest alleyways, burdened by the weight of the neighborhoodâ€™s long, bloody past.